I'm a web developer from Manchester, UK writing about modern PHP and web development. I take great pride in my work, here are some projects I’ve been working on recently. I help build Venditan Commerce, an end-to-end e-commerce platform spanning retail, B2B, EPoS and warehouse management with the Venditan team. Since 2014, as a senior developer on the back-end team, I shape and build new innovations to the platform while speaking directly with our partners to fulfil their businesses requirements. Venditan Commerce powers the e-commerce and retail business of partners such as Nest, Sigma Sport and Saltrock. Incidentally, we are hiring PHP developers so if you’re interested check out our careers page or take a look at venditan.com. Between 2012 and 2014 I worked as a freelance contractor for Spring Studios, a creative digital agency based in London, England. During my time with Spring, I helped re-build the agency’s website alongside the digital design team. Working as the sole developer on the project, we liaised with all departments to create a robust dynamic content-managed website allowing individual teams to manage content relevant to their department, replacing the previous static website. View the Spring Studios project page for more screenshots and information. Bally are a luxury leather goods company founded in 1851, globally recognised for its ‘Swiss Made’ quality and contemporary style. During my time at Spring Studios, Bally were one of many clients I was involved with. As a member of the digital development team, I worked on the experience and editorial site to create cutting edge web experiences befitting the Bally brand. View the Bally project page for more screenshots and information. My partner is a talented jewellery designer and has been running her independent hand-crafted jewellery business since 2009. 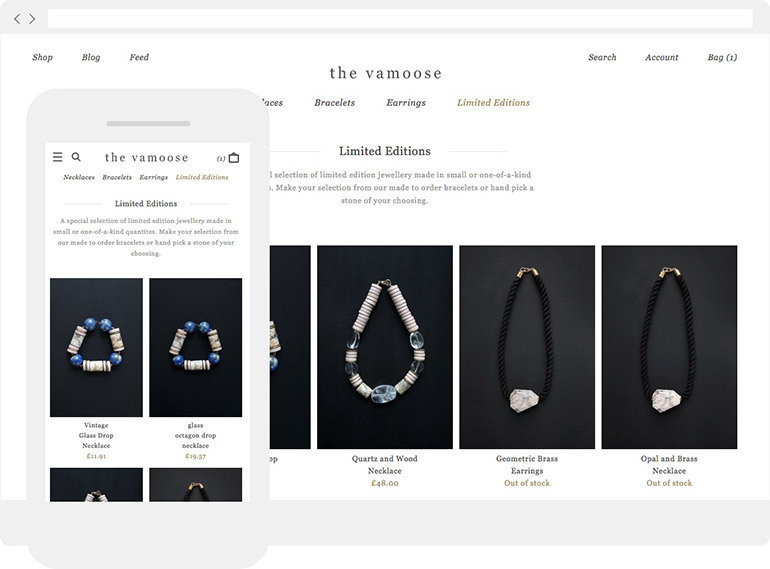 Initially on Etsy, we first launched The Vamoose e-commerce store and blog in August 2010, followed up by a re-design in April 2015. The e-commerce store itself is built on PrestaShop, however we are currently working on a brand new version using Magento 2. The blog is a custom Laravel application tailored to Kathryn’s needs. View The Vamoose project page for more screenshots and information or visit thevamoose.com directly.